In the last year or so, I've noticed a few comments recommending a Mexican food delivery service called Las Adelitas. I do love Mexican food, so I was very curious. My demand for authentic south of the border cuisine (I'm not talking Austria) has not been met by supply in Prague. I stand by Fosil as my favorite and perhaps the only option for something close to the real deal. Even if the service is always discombobulated. Anyway, back to Las Adelitas. One must understand that they don't have a restaurant you can actually sit down and eat in. Yet. In order to try their food, I had to place an order. I organized a group of colleagues, and we arranged a delivery. It is important to note that they have free delivery to Prague 1, 2, 3, and 5. I work elsewhere, so they told me there'd be a 150 CZK delivery charge. No problemo. But even without any previous experience, I had a feeling we'd have a long wait. We tried to get the order in by noon, but still, it took around 90 minutes for delivery. Cooking time and traffic must be accounted for. The delivery guy showed up with a big thermal box in a regular taxi. The fare for the return trip would be more than 150 CZK, but he said they share the cost for the delivery to keep it reasonable. I dashed back into the office and opened the foam clam shell to behold my Burrito Mixto (138 CZK). I tried everyone else's orders, and I'll tell you at the top, this was my favorite. 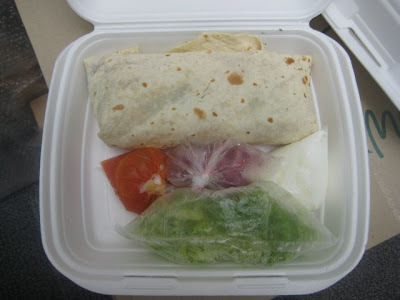 Next to a rolled flour tortilla were neatly bagged side items: lettuce, sour cream, sour red onion, and a salsa that seemed like watery tomato puree with a good dose of chili. The bags didn't leak! 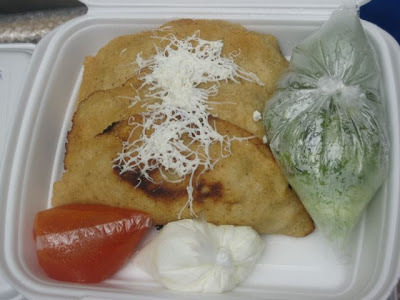 PB ordered Quesadillas de Pollo (164 CZK). There are three to an order. They were not quesadillas like any I'd had before. These were made with corn tortilla, but thicker. They were something like a turnover or meat pie. PB was not enamored. He thought the tortillas were on the greasy side. The menu said they were filled with a stewed chicken made with a special recipe, but he thought it needed seasoning. It had the same bagged fixin's on the side. 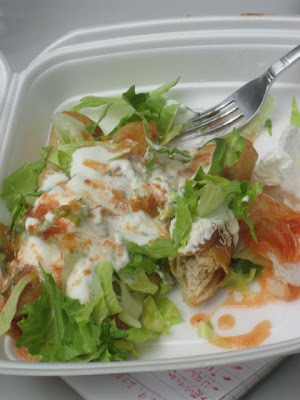 GP got the Flautas de Pollo (169 CZK). 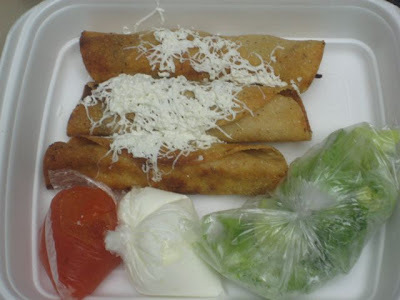 There were three crispy, rolled corn tortillas. They were filled with what the menu said was a mix of chicken, tomato, onion, and spices. But again, we thought the chicken inside was boring and needed a boost. Not sure if it is proper procedure, but he mixed up the lettuce, sour cream, and salsa and made his own little side salad. 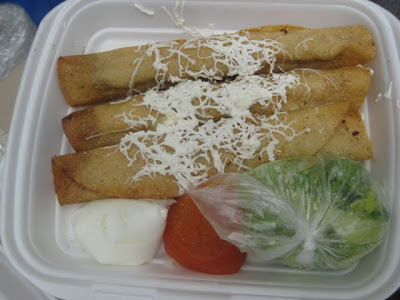 PB got the Taquitos Dorados (95 CZK). As the menu stated, this was essentially the same as the Flautas de Pollo, just a smaller portion. 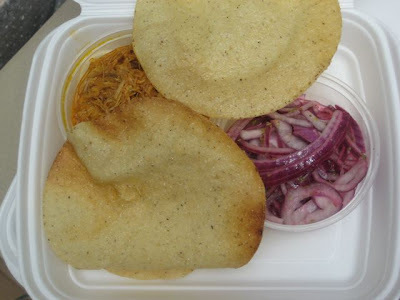 Last but not least, MB got the Tostadas de Conchita Pibil (105 CZK). There were two crispy corn tortillas with separate containers for the marinated pork and red onions. It was not a big portion but she was quite happy with it. She said the pork was really delicious. Good food, good price. So there you have it. My advice is order anything with the pork in it. Good stuff. And order as close to 11 a.m. as you can on a weekday. I wanted a little more information, so I got in touch by email with Patrico, one of the two young Mexicans behind the Las Adelitas. I asked him the first and foremost question on my mind: What made the pork so good? "Love," he wrote. Fair enough. He didn't want to give away any trade secrets. 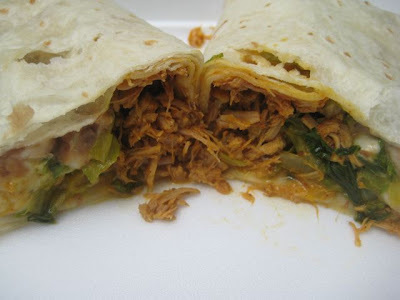 But he did add that the slow-roasting recipe from Yucatan is also known as Conchinita Pibil. Hence the name of the offering that MB liked so much. Patrico also gave me a little background. He said that Las Adelitas started more than a year ago. He and his friend, Rodrigo, a chef who went to culinary school in Mexico, put on a cooking exhibition during a football tournament at Strahov. It was so popular, they decided to start their business. Patricio said they do sometimes get complaints about slow delivery because they don't always have enough people to transport the food. He added they also do catering, especially for a certain embassy that appreciates real Mexican cooking. However, the most interesting news of all is that they plan to open an actual restaurant. When and where that is, we'll have to wait and see. I'd certainly give them a try. I'll be curious to see if there is success beyond delivery.